Area Code comprises: * Dave Dales on pedal steel guitar, guitar, dobro and backing vocals; * Ted Denson on guitar, mandolin and backing vocals; * Glen Ward on lead vocals and percussion. 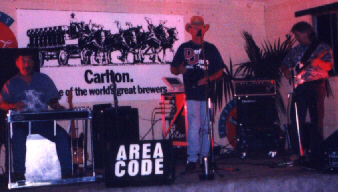 Area Code regularly perform in Tumut and surrounding areas and for the past seven years have appeared at the Tamworth Country Music Festival at venues such as the Locomotive Hotel, the Tattersals Hotel, the Oasis Hotel (supporting Chad Morgan), and Brumbys Tavern. Area Code perform new country from artists such as Garth Brooks, Chris LeDoux, The Highwaymen, Lee Kernaghan, Alan Jackson, Kevin Shegog, Slim Dusty, Delbert McClinton and many others. Rock music is also performed from artists such as Sting, Paul Kelly, Tony Joe White, etc. Their debut album "Area Code" was released in January 1994 at the Tamworth Country Music Festival and features songs by some of these artists and represents the band's diverse musical influences. During the 1998 Tamworth Country Music Festival Area Code are appearing at The Locomotive Hotel: 23rd, 24th, 25th January and Joe Maguires Hotel, JR's Woolshed 21st & 22nd January. Further information can be obtained by e-mailing the maintainer of this site.